A lot of us love powersports because we love the freedom of the outdoors. If you’re like me, it all started at a young age and by the time I was a teenager, I spent much of my free time navigating through the wilderness to my favorite hunting, fishing or camping spot, relying on the skills learned from my Boy Scout merit badges to get me into the most remote territory. As it turns out, I learned of another way when MPN was invited to Ontario, Canada, for the 2018 Argo Dealer Expo, celebrating their recent 50th anniversary, announcing a new strategy for the company and giving us the opportunity to learn about their new products and take them out for a spin. In 1962, Ontario Drive and Gear Limited (ODG) was founded and they developed and manufactured a special transmission for a six-wheel-drive skid steer ATV. Then, in 1967 they began to produce their own six-wheel amphibious vehicle, the Argo, aptly named after the heroic Argonauts from Greek mythology who were known for their stamina on land and water. Now, with over 50 years of experience manufacturing and improving their products, Argo offers a full line of amphibious XTVs (Extreme Terrain Vehicles) and accessories to maximize their potential for all seasons and conditions. In 2017, they introduced the all-new Argo Xplorer line of ATVs. For 2019, Argo is adding seven all-new XTV models to their lineup. The Aurora family of eight-wheel vehicles is redesigned from the ground up, featuring an automotive-inspired body, seating, controls, steering system, gauges and more. The Avenger Bigfoot MX-6 and MX-8 models are equipped with ultra-aggressive 25-in. mud tires, aluminum bead lock rims and a premium sound system. 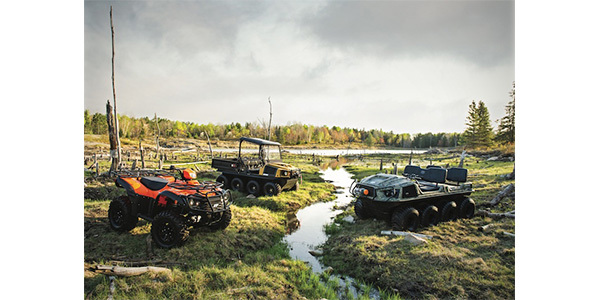 The Frontier, Avenger and Conquest families remain in the Argo line of amphibious XTVs and are available with a full range of engine and transmission options, six- and eight-wheel platforms, hunting packages and custom accessories. During the expo, the company emphasized their “Go Anywhere” motto for the XTV line as well as their new approach of “Doing Things Different,” and as part of this, they have also created a completely new type of outdoor experience in a “Tiny Lodge.” It was apparent that everyone at Argo is extremely passionate about their products and focused on expanding product awareness and bringing on new dealers. Director of Marketing Dean Dutcher explained why Argo decided to do things differently with the “Tiny Lodge” campaign that pairs a vehicle with a memorable experience. Eager for some real time behind the wheel of the new Argo XTVs and ATV line, a stay was booked and a day’s road trip landed my girlfriend and I at the Tiny Lodge. Located in northern Wisconsin in the middle of 2,000 beautiful acres, there was indeed a tiny lodge, surrounded by lots of wildlife, water and woods with Argo XTVs and ATVs fueled up and ready to explore the territory. The hospitality of lodge host Jim Kedinger made us feel right at home and whether it was relaxing by a campfire at the edge of the lake, hunting, fishing or navigating the vast network of trails, the choice was ours and we took full advantage of all of it, including many hours of first-hand wheel time in the XTVs and ATVs. Wildlife sightings included a couple of species not seen in my neck of the woods, such as porcupines and the occasional elusive Sasquatch. Diverse terrain offered hills, curves, rough and smooth surfaces and a large lake with trails leading in and out. Covering the land in an Argo ATV was as effortless as you might expect, with the steering and suspension providing a confident, sure-footed experience. Spending time in the saddle of an XTV really lends to realizing what these vehicles can do. They feel strong, powerful and unstoppable. Covering all ground, in and out of water and over trail hazards, they are like a draft horse, pulling, plodding along without even the slightest indication of effort. Simple controls provide easy learning for any driver and when smooth trails are ahead, easy acceleration quickly covers ground when you need it. The Frontier 6×6 impresses as a “sportier” model and is equipped with their Classic transmission, offering simplicity in design yet providing zero radius turns for nimble handling in all conditions. The skid-steer reaction of the steering is quick but doesn’t take much practice to master. The new Aurora eight-wheel models give you the latest Argo engineering with their new Admiral transmission and Argo Progressive Steering. A spring element between the handle bars and the brake system for the transmission steering differential is the innovation behind the progressive steering and it was smooth and predictable, practically eliminating any learning curve. Optional bead-lock rims allow lower tire pressures and smooth the ride considerably. Regardless of model, there is certainly no feeling like driving right into a body of water. The paddle-designed tread of the tires pushes you easily through, and pulling back out is just as effortless. Outboard motor brackets are just one of the custom accessories you can get if you need more speed on the water. The feeling of complete confidence when driving an XTV is almost hard to describe, but for this editor, it’s time to turn in my merit badges; I have found another way.